The parents of Live Oak Little School, Inc. students are vital to our school’s success and growth. Here are what some of our parents have to share with future members of the Live Oak Family! "My daughter has been at Live Oak Little School since she was 6 months old. For a parent, the anxiety of leaving a child in someone else’s care, can often be overwhelming, and it was for me. However, the school’s director, Kathleen Allison, provided me with the assurance I needed; I needed to know that my child was going to be loved. Now that my daughter has moved into the “Sprouts,” I am assured that not only is she loved by all of the teachers, but my daughter is also in an environment where reading books and learning about the world around her is at the core of the Live Oak Little School." "Recently, my three-year-old son turned the usual clatter and chaos of fixing dinner into an impromptu choir performance. As a bubbling tangle of pasta threatened to surge the boundaries of the pot, Jack enthusiastically began singing a song about condensation and evaporation, terminology that sent me shuffling through the mismatched Wikipedia of my mind. I owe the serenade – and the fact he can sing it – to you all." For more than two years, Jack has been a part-time student in this happy environment, where he spends his mornings doing the essential things that help him grow into himself a little more each day – painting and planting flowers, chattering at the resident chinchilla and learning to share, practicing manners and perfecting his hopping technique, and celebrating everything from the change of seasons to the weekly treat of a pizza lunch on Fridays. While this all takes place under the umbrella of a sound, well-developed curriculum that encourages parental and community involvement, what matters most to me is the nurturing, devoted group of teachers who truly know Jack’s quirks, joys, strengths and challenges – as well as those of every student. For example, when Jack needed assistance with speech, the director, Kathleen Allison, generously found a speech therapist who best met our family’s needs, and the teachers partnered with us to develop Jack’s language skills into what is now a non-stop commentary on life as he knows it. These trusted teachers inherently understand a fundamental aspect of human nature – we all want to be seen and heard, no matter how old we are. Daily, I hear teachers regaling parents with seemingly small moments of their child’s day. But one after the other, those anecdotes weave together to form a portrait of a child, a foundation for life beyond the preschool playground. How grateful I am that my son gets to begin his childhood here." We also get comments from parents online. Here's a couple but you can read for yourself here. "My son has attended Live Oak Little School for about a year now. In this time he has learned and grown so much in so many ways. Everyday he amazes me with describing items and their colors, counting, and singing. (He''s just barely 2) The teachers here are truly invested in their work and it shows. My first concern when I began taking our son to daycare was that he would not get the attention he is given at home and with family... however, those fears were quickly squashed when I began to see the interaction the teachers have with not just our child, but all the children in their care. I am so grateful to these women and men. It makes going to work so much easier for my husband and I everyday knowing he's in such culpable, caring hands. It''s also a terrific feeling seeing each morning his excitement to get dressed and ready to head to school to start a new day. Thank you to all at Live Oak Little School!!!" "We love Live Oak Little School. I have 2 daughters, one attended until she moved on to elementary school and the other is still in attendance since she was 12 wks old. All of the teachers are so loving and like family to us. We have had nothing but good experiences here and highly recommend it. Safe environment, very clean and nurturing teachers. 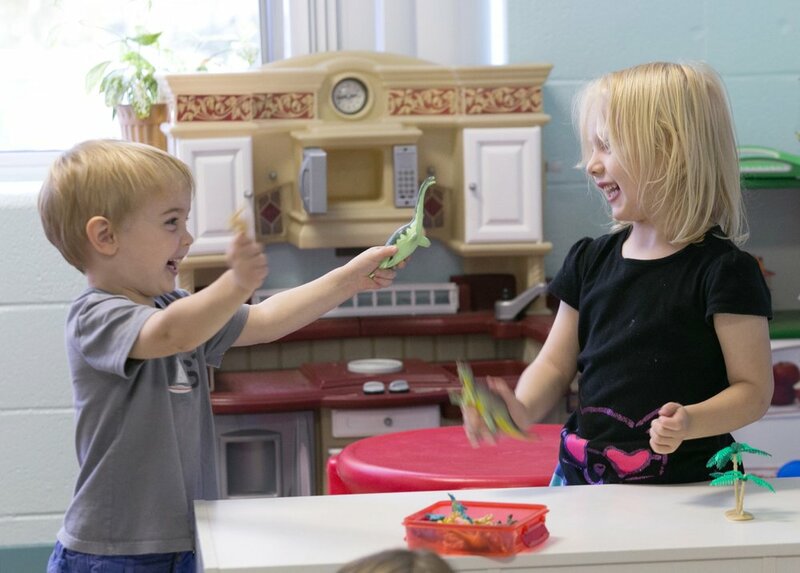 My oldest daughter has learned so much that wouldn't normally be taught in a typical daycare."